The metering in most DAWs does little more than tell you if you're in danger of clipping. Zplane's plug-in suite provides vital alternative ways of understanding audio levels. PPMulator provides a very clear emulation of the classic BBC PPM meter. Since the dawn of the electrical recording age over a century ago, metering has been an integral element of professional audio systems, and critical for the consistent control of signal levels. The VU meter is the standard bearer as (arguably) the longest-serving form of meter. The design we all know today was defined in 1939, but its origins predate that within the telecoms industry, while in broadcasting circles — where accurate control of peak levels is critical — the Peak Programme Meter (PPM) became de rigueur in various forms from 1929. In our modern digital age, the digital sample peak meter has become the de facto standard, but whereas the VU and PPM scales were carefully designed to make level control intuitive, the sample peak meter actually makes it difficult, in many cases — not least by displaying the full headroom margin, thus encouraging people to record at far higher levels than they really should! With this in mind, I think there is a lot to be said for continuing the use of traditional meter formats even when working with digital equipment, at least when tracking and mixing. One very practical way of doing this is to use a dedicated metering plug-in, such as PPMulator from Zplane, which is available in RTAS, AU and VST formats and can also be used as a stand-alone program. I've been using it for several years now, mainly because it provides a very good graphical simulation of the traditional BBC-style PPM, which I find much more comfortable and familiar to work with than the standard digital peak meter provided in most DAWs; assuming something like a 15dB headroom margin, the upper half of the standard digital meter is virtually unused when tracking. The PPMulator display is hugely configurable. In addition to the very traditionally styled 'moving needle' BBC scale (officially defined as the IEC 60268-10 Type IIa meter, and configurable as separate left/right meters or a twin-needle version including the classic AB/MS twin-twin display), the current '+' version of PPMulator also provides three bar-graph alternatives. The first two are Type I scale variants (Nordic N9 and DIN 45406), both of which display much lower signal levels than the Type II scales. The third bar-graph option is the EBU PPM (Type IIb) scale. All of these bar-graph meters can be oriented vertically or horizontally, and configured for mono, stereo (left/right, Mid/Side, or both at the same time if required), and 5.1 surround applications. A goniometer (Lissajous figure) display is also available to reveal more stereo imaging and width information, and a phase-correlation meter can be added to the surround meter modes. In situations where it would be helpful to add a correlation meter to a stereo meter display, the only option is to select a surround display mode and disable the unwanted channels, although this happens automatically on most DAWs if configured with only two output buses. The size of the meters can be altered and positioned to suit, and the input channels can be relabelled if required. Although the default settings provide accurate standard ballistics and reference/overload levels for each meter type, these are all fully adjustable. The default alignment sets the Test (PPM4) point to the EBU standard of -18dBFS (the DIN meter zero aligns to -9dBFS), but if you wish to work with a smaller headroom margin, the reference level slider on the configuration page is simply moved to a higher value. When a derived mono meter is selected, the left and right channel summing can be configured with either a 3dB or 6dB level reduction (known as M3 and M6, respectively), the former being the BBC's historic method and the latter being the modern global standard. When PPMulator is being used as a plug-in, a peak-logging function becomes available to log highest metered level and any overloads against the DAW's timeline. This is very handy for checking the levels of a long programme without having to stare at the meters continuously! PPMulator also includes a tone-generator facility to create alignment tones for use with other systems. In stand-alone mode, PPMulator can only monitor input streams, not outputs, which makes it rather less useful, but this is because most programs outputting audio do so directly to the soundcard, and PPMulator cannot access that data stream. A drop-down box allows the required input source to be selected, along with the buffer size and sample rate. The additional cost of the XL version is justified by the inclusion of true peak (above) and loudness metering. The PPMulator software has been enhanced considerably this year, and a second version is now available, called PPMulator XL. This expands upon the standard features with two extra metering modes, plus some new Peak and 'Over' display hold options. There is also a new offline batch file-processing facility for the stand-alone version. This enables final mixes to be level-checked much faster than real time before dispatch to the client. The enhanced peak-hold display system means that even with Peak and Over hold mode selected, any overs detected after the first one are still indicated and can still be seen. It sounds trivial, but it is a very helpful improvement. The first new meter mode is a 'true peak' meter that meets the relatively new ITU-R BS1770-2 standard. Normal digital meters are 'sample meters', which means that they show the amplitude value of each metered audio sample, or the highest sample evaluated in a batch of metered samples. For most purposes this is quite adequate, but some signal peaks are missed because the reconstructed signal can, quite legitimately, achieve amplitudes that are higher than 0dBFS samples — a phenomenon often referred to as 'inter-sample peaks'. This is a problem in mastering applications, for example, where extremely accurate peak level metering is critical, but also whenever oversampling and digital filtering is applied, such as in MP3 coding. To overcome this problem, the ITU has defined a metering technique known as 'True Peak', which employs oversampling to reconstruct the complete audio waveform very accurately within the metering algorithm, and thus detect the true signal amplitude regardless of the individual sample values. This meter scale is calibrated in dBTP — the last two characters indicating the 'true peak' status — and can indicate values above 0dBFS (which will produce overloads when the signal is reconstructed). The second new meter type is the real raison d'être of the XL version: the EBU R128 loudness meter, which is an emerging international broadcast requirement. The idea behind this new form of meter is, finally, to provide a reliable objective means of measuring and describing perceived loudness, so that different programmes and broadcast channels can adopt and maintain a consistent loudness. Hopefully, as this metering standard enters routine broadcast operations, the all-too-familiar need to adjust the volume at each programme junction will come to an end. The loudness scale measures 'LUFS' (loudness units relative to digital full scale) or just LU (loudness units), either continuously or integrated over time. The integrated mode is tied to the DAW's transport controls, so that it only evaluates the signal loudness when the audio timeline is running. The R128 display can also be switched to show simple text boxes providing easy-to-read values of integrated loudness, loudness range and maximum true peak level, giving a handy summary of the programme loudness and peak levels. The standard PPMulator+ is an extremely useful and very versatile metering plug-in already widely used in broadcast and post-production circles, where 'desktop editing' is increasingly common. 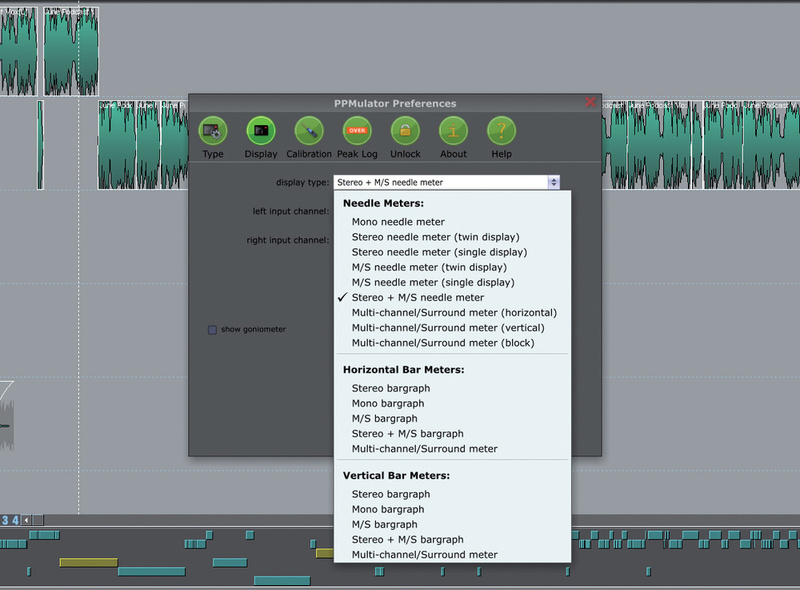 In these situations, more operationally relevant and eye-friendly metering than the standard DAW offerings is often required, and PPMulator meets these needs admirably. While the BBC meter emulation graphics won't fool anyone familiar with the real mechanical meter, the ballistics and characteristics are very closely matched and work extremely well in practice. Moreover, the range of metering styles and the ease of recalibration to alternative operating levels makes the plug-in a joy to use. For example, I typically use the default settings when recording and mixing broadcast-standard material, but recalibrate to an elevated reference when making podcasts and spoken-word CDs, where a much smaller headroom margin is desirable. The new XL version is the must-have option for anyone involved in mastering (in which the ITU-R BS1770-2 true peak metering is a life-saver), or in broadcast and post-production, where the EBU R128 loudness metering compliance is increasingly demanded by production companies and broadcasters. This is a plug-in that will live in your output channel for ever! Excellent metering graphics, including moving-needle emulations. Accurate default ballistics and level calibrations. 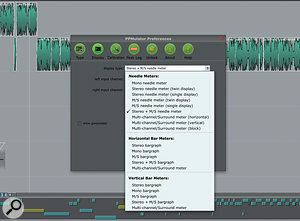 True peak and loudness metering modes in XL version. Stand-alone mode can only meter system inputs. A very versatile and well-designed metering plug-in that would meet most needs in standard PPMulator+ form, but with the benefit of true peak and loudness metering in the XL version. PPMulator XL £116.62; PPMulator+ £77.42. Prices depend on Euro exchange rate and include VAT. PPMulator XL $149; PPMulator+ $99.